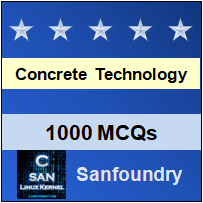 This set of Concrete Technology Multiple Choice Questions & Answers (MCQs) focuses on “Concrete Repair System”. Explanation: There are following types of Air entrainment in concrete which helps to increase the workability. 2. In a dry environment, concrete strength will be loosed as much as ___________ % in moist environment. Explanation: Laboratory tests show that concrete strength will be loosed as much as 50% in dry environment as compared to moist environment. 3. Concrete placed in cold weather will take ____________ time to gain strength. Explanation: Concrete placed in cold weather will take longer time to gain strength, delaying form removal and subsequent construction. Explanation: After finishing concrete surface must be kept wet, so that it’d be prevented from evaporation. Explanation: Dry intervals or patches can lead to crazing or cracking on the slab surface. 6. Which one is not chemical admixtures? Explanation: Accelerators, retarders, water reducing agents are the chemical admixtures and silica fumes is mineral admixtures. 7. Damp proofing ____________ resist water well enough. Explanation: Damp proofing does not resist water well enough to prevent oversaturation from ground water, or excessive and constant humidity. 8. Chemically active pore fillers ____________ the setting of concrete. Explanation: Chemically active pore fillers accelerates the setting of concrete and thus render the concrete more impervious at early age. 9. Chemically inactive pore fillers ____________ the workability. Explanation: Chemically inactive pore fillers improve the workability and to facilitate the reduction of water for given workability and to make dense concrete which is basically impervious. 10. “Water repelling materials like soda, potash soaps, etc make the concrete pervious”. Is this statement true or false? Explanation: Water repelling materials like soda, potash soaps, calcium soaps, waxes, fats, vegetable oils repel water and make the concrete impervious.